If you're going to wear Manizi blazers and tuxedo jackets, you're simply going to knock people's socks off. That is because Manzini makes their blazers for full maximum impact. These blazers and tuxedo jackets are worn by Celebrities and well dressed men world wide who don't shy from style. 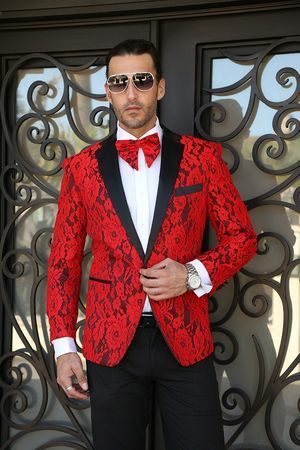 This fancy red designer tuxedo suit jacket features a fancy pattern body with the addition of rich black lapels in a designer collar style. Modern fit with side vents.